We prove that if a group ring $RG$ is a (quasi) Baer $*$-ring, then so is $R$, whereas converse is not true. if $R$ is (quasi-) Baer $*$-ring, then so is the group ring $RG$. We prove that if the group ring $RG$ is a Baer $*$-ring, then so is $RH$ for every subgroup $H$ of $G$. (for principally quasi-Baer and principally projective rings). E. P. Armendariz, A note on extensions of Baer and p.p.-rings, J. Austral. Math. Soc., 18 (1974), 470-473. G. F. Birkenmeier, J. Y. Kim and J. K. Park, On polynomial extensions of principally quasi-Baer rings, Kyungpook Math. J., 40(2) (2000), 247-253. G. F. Birkenmeier, J. Y. Kim and J. K. Park, Principally quasi-Baer rings, Comm. Algebra, 29(2) (2001), 639-660. G. F. Birkenmeier, J. Y. Kim and J. K. Park, Polynomial extensions of Baer and quasi-Baer rings, J. Pure Appl. Algebra, 159(1) (2001), 25-42. 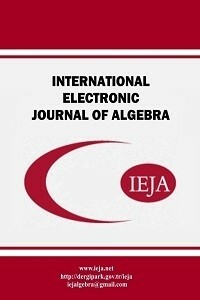 G. F. Birkenmeier and J. K. Park, Triangular matrix representations of ring extensions, J. Algebra, 265(2) (2003), 457-477. W. E. Clark, Twisted matrix units semigroup algebras, Duke Math. J., 34(3) (1967), 417-423. N. J. Groenewald, A note on extensions of Baer and p.p.-rings, Publ. Inst. Math. (Beograd) (N.S. ), 34(48) (1983), 71-72. Y. Hirano, On ordered monoid rings over a quasi-Baer ring, Comm. Algebra, 29(5) (2001), 2089-2095. I. Kaplansky, Rings of Operators, W. A. Benjamin, Inc., New York- Amsterdam, 1968. A. Khairnar and B. N. Waphare, Order properties of generalized projections, Linear Multilinear Algebra, 65(7) (2017), 1446-1461. B. N. Waphare and A. Khairnar, Semi-Baer modules, J. Algebra Appl., 14(10) (2015), 1550145 (12 pp). Z. Yi and Y. Zhou, Baer and quasi-Baer properties of group rings, J. Aust. Math. Soc., 83(2) (2007), 285-296. L. Zan and J. Chen, p.p. properties of group rings, Int. Electron. J. Algebra, 3 (2008), 117-124. L. Zan and J. Chen, Principally quasi-Baer properties of group rings, Studia Sci. Math. Hungar., 49(4) (2012), 454-465.